Four Congress MLAs led by disgruntled Gokak legislator Ramesh Jarkiholi have reportedly gone incommunicado. A no-confidence motion could be in the offing ahead of the State Budget this week. Bengaluru: Ahead of the State Budget in Karnataka, four Congress MLAs from Karnataka have gone incommunicado, sending a message to party leaders that they are still unhappy and unlikely to support the coalition. Among the camp is former minister and Gokak MLA Ramesh Jarkiholi who is upset with minister DK Shivakumar's intervention in Belagavi affairs. It is Ramesh who allegedly took the initiative to bring more disgruntled MLAs into the BJP fold. Along with Ramesh, Ballari rural MLA, B Nagendra, Athani MLA Mahesh Kumathalli, Maski MLA Pratap Gouda Patil are camping in Mumbai. Reports state that they too have gone incommunicado. However, Congress leaders have denied this and have said that all the MLAs are with them, VS Ugrappa, a Ballari MP has conceded that Nagendra is in Mumbai. "Our efforts are on to bring back those disgruntled MLAs," he said. Congress Legislature Party leader Siddaramaiah is reported to have spoken to one of the disgruntled MLA Pratap Gouda Patil and convinced him not to leave the party. Congress leaders like Dinesh Gundu Rao and Eshwar Khandre have held talks with another disgruntled MLA from Chincholi, Umesh Jadhav and convinced him to remain with the Congress in case the BJP plans to move a no-confidence motion. “Jhadav has expressed his displeasure over interference of minister Priyank Kharge. We have sorted out all differences. To keep the flock together, Siddaramaiah is hosting a dinner at his official residence 'Cauvery.’ Few ministers will be given charge to ensure no MLAs crossover to the BJP. Similarly, all MLAs have been invited for dinner on Wednesday hosted by deputy chief minister Dr G Parameshwara," said a senior party leader. The Karnataka BJP which has allegedly been making efforts to bring down the Coalition government, this time has taken a stand on the issue and says that the BJP will not take any decision to dislodge the government and said that the Congress legislators are the ones who have distanced themselves from their party and the BJP has got nothing to do with it. "The decision to table a no-confidence motion against CM HD Kumaraswamy's government is left to the legislative party," said S Prakash, BJP spokesperson. Tomorrow there will be a joint legislature party meeting. It is speculated that the BJP will table of no-confidence motion in case enough number of legislators fail to turn up to support HD Kumaraswamy. At present, the Coalition has got the support of 118 members including 80 from Congress, 37 from JD(S) and one from BSP. The opposition has 106 members, BJP has 104 members and is supported by one independent and one from the KJP. All eyes are set on 113, the magic number to form and run the government. 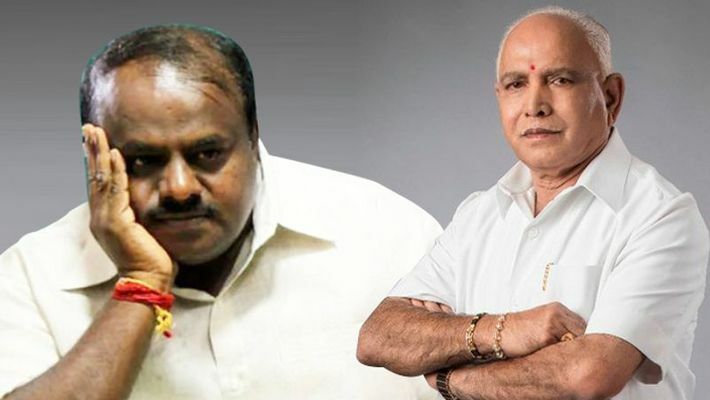 Yeddyurappa audio that Kumaraswamy released to claim BJP is wooing Congress, JDS MLAs fake? Ground report: Will Rahul Gandhi rise from south via Wayanad?